I have a number of items to comment on. First, our AGM was held on the 24th of February. There have been no changes to the committee with all serving members re-elected. Second, and more importantly in my mind, the calendar of activities for 2013 is now complete. It will be another busy though rewarding year for FoEC and the EC. I want to highlight the March event (see the calendar for further details). As we have had a very busy season for snake sitings I have secured the Snakehandler to come and present a reptile awareness session on Sunday March 17th from 1.00 PM near the Ronald Street footbridge. I should also note that on the same day there will be a public feedback opportunity for the draft of the Edgars Creek Management Plan, I believe from 10.00 AM -12 noon (check with Moreland City Council to confirm these details - though I believe the free coffee van will be on site again!). A final note, Water Watch testing will be happening this Sunday. And in conclusion; you've got to love the rain! Meet at the Ronald Street footbridge, North Coburg (Melways Map 18 A9). the Silurian Cliff to the Kodak Bridge. Cliff site (opposite the removed willows). north past the bridge (Melways Map 18 A8). local ‘Friends of’ groups; Celebrating World Environment Day. North Coburg (Melways Map 18 B-C7). waterhole – at the top of the escarpment. David on 0428 130 268 or email david.pavone@austin.org.au for more information. FoEC thank Melbourne Water for their continued support of our work. We thought that we would share this information with the community. The new soccer club at De Chene Reserve the Moreland Zebras is applying for a liquor license. They are applying for 7 day a week liquor licence. Up to 11 pm most nights except Fri/Sat which will be to 1am. They have applied to be able to drink outside to. If you have any worries about this you need to write to the liquor license board. I have been doing some plant thinning and making room for a sandpit so I have some plants for people to take if they would like – I am going to put them on the nature strip, mostly as there is no room elsewhere – 13 Meadow street. Some bromeliads, tree plants and some others – there are a couple of pots – would be appreciated if pots came back. Thanks all and happy gardening. · Food Swap in the environment workshop tent from 1pm-2.30pm! Bring home grown produce to swap with others. · Children’s flag making and native plant printing from 2-5pm in the Merri Creek Management Committee tent. · Water Walks and Talks at 2pm, 3.30pm, 5pm and 7.30pm – leaving from the environment tent. · Saving Water at Home - Practical Plumbing Demonstrations and Talks at 2.45pm and 4.15pm – at the environment workshop tent. Apologies if you have already received this information. Free car seat, small table and fire screen. Car seat is in good condition and is suitable for ages 6 months upwards. Hasn't been in any accidents. Safe and Sound brand. Table is coffee table sized and is solid wood and OK condition. Fire screen is metal with folding sides. I am an artist/teacher/milliner in my early 40s, I'm looking for a female housemate preferably 30+ to share my cute colourful house in Coburg, right opposite the Merri Creek with myself and my two cats. The house has polished floorboards, good oven, vegie patch, is close to Bell St. public transport, parklands and bike paths to East Brunswick. Would suit someone who is busy but friendly, knows how to clean and recycle, and doesn't have a lot of furniture. Rent $160 per week + bond + bills. Available 16/3/2013. Just heard about this on the wireless this morning. Have I been living under a rock? Anyway, sounds like a great event on our doorstep. Waterwatch is presenting a free public talk on macroinvertebrates (waterbugs) in the Merri Creek. Come along and find out about their life cycles, biology and importance to stream health. Also see live examples of many of these fascinating creatures. Please ring 0408 029 011. 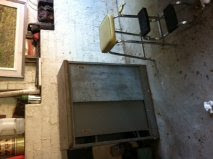 Steel cabinet w shelves and sliding doors, colour: jeans grey/blue. Comes with retro household step stool. Pick up from 56 Livingstone street. News from Newlands in Scotland! I got this lovely email from Alan in Newlands wanting to let us know how well the local tennis club are going. He thought this blog was his local! It turns out we are not so local but I think it is good to know what is going on in places called Newlands around the world. Haha! My mistake. Newlands is a suburb of Glasgow in Scotland! Yes, by all means post the story, with perhaps an amusing introduction explaining the confusion. And hello from Scotland where it's 0oC and snowing! NEWLANDS Lawn Tennis Club is Tennis Scotland's 2012 Club of the Year. The prestigious award is given to the club which has made a significant contribution to the development of tennis inScotland over the last twelve months. Located in Glasgow's south side with well over one thousand members, a third of whom are juniors under sixteen, thriving Newlands is one of Scotland's top sports clubs. With four indoor courts and seven all-weather courts, four of which are floodlit, it caters for adult, team, social and junior tennis at all levels. The family-friendly club also boasts five squash courts, a modern, fully-equipped gym and a comfortable clubhouse. New club President Adrienne Airlie said: "We're delighted to win this fantastic award. Andy Murray's success last year made it an historic twelve months for Scottish tennis and at Newlands we also enjoyed an outstanding 2012. “The award is testament to the hard work of so many people in our wonderful club. We have been so fortunate to have such a brilliant group of committee members over the years such as Alan Pearson, Dougie Cumine, Tom Culshaw, Bill Laird, Dave Crorie and many more. Their vision within tennis, squash and community interaction has taken the club to where it is today - what a legacy to hand on to all our younger member and families. In awarding Newlands the coveted title, the judges noted that both the adult and junior programmes were successfully re-launched which led to a rise in participation in existing and new members. They also commended the club for working hard on its outreach programme with local nurseries and schools and for raising the club's profile in the local community. And finally, they noted players of all ages enjoyed representing their club and achieving success at many events - from local leagues and cup competitions through to national and international events. Head Coach Michael Welsh, who was also shortlisted for Tennis Scotland's Coach of the Year, is in no doubt why Newlands won the award. "In the last couple of years we've systematically nurtured the junior side of the club. We've got one hundred and thirty juniors under 8 and a further two hundred and fifty under 16. They are the future of the club and we give them every opportunity to develop their skills as they mature. "For the future, our priorities are to keep the momentum going and build on what we've achieved. We'll keep standards high at Newlands and we'll keep pushing for more success." A number of club members were nominated in other categories - Anna Brogan for Junior Player of the Year, Christine Lockhart for Veteran Player of the Year and Marjorie Love for Veteran Player of the Year while Newlands Ladies 1st Team was shortlisted for the 2012 Team of the Year. You might be able to help me with this. I am a hypnotherapist who is currently offering my services in LETS. As part of my Continuing Education I am currently studying "Sleep Talk" (TM Joane Goulding) a method for enhancing children self esteem. I would like to call out for 3 sets of parents who would be willing to implement the method with their children. There would no fee involved. Just meeting with the parents, a questionnaire to fill out and a commitment on their part to dedicate 5minutes of their time at night. Then at the end of a two months period we meet again and assess changes. I will be very grateful if you could let everyone know about this offer maybe using an email? 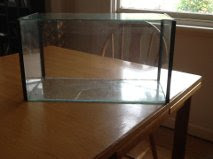 FISH TANK - free to anyone who can use it! It has a crack in the bottom, so would suit someone wanting to setup for a hermit crab or similar. Contact me on louiseckent@yahoo.com if you'd like it. Does anyone have a house available to house sit between July 20-Aug 11, 2013? It's for a family of 2 adults and 3 boys aged 8, 6 & 2. They are expats in the Emirates returning home to Escape some of the worst heat of the year and spend time with family who are in the Coburg/Pascoe Vale area. Please let me know if you can help - even if not for the whole time. What’s happening with the Government’s planning strategy for Victoria?Come along to find out more. The Baillieu government has released a new discussion paper on the Metropolitan Planning Strategy, to map out Melbourne’s future in coming decades – but what will this mean for people in Moreland? Local resident and town planner Lester Townsend works with the Metro Strategy Ministerial Advisory Committee, and will outline the strategy and some history of strategic planning for inner city suburbs like Brunswick and Coburg at our coming residents' update meeting. We'll have a Q and A on Planning Minister Matthew Guy’s vision for a “20 minute city” and how changes to Victorian planning will affect our local community. I'm working on a startup thingie called Popup School that hires people to run workshops of various kinds in various venues. The workshops are for adults. We're starting very slowly. One workshop in April, one in May, etc. Just to see if it works. The website has gone live today with the first half-day workshop on it - Speak Up! voice techniques for reluctant public speakers. The teacher is a fabulous woman called Nicole Muir. She trained in Playback Theatre, has done a heap of public speaking and compering, and is currently Managing Director of the Australian Girls Choir. Speak Up! is a workshop I've been looking for ever since I started having to get up on stage and talk about my writing -- most of the courses I'll be programming will be ones I've actually wanted to do myself but couldn't find, or couldn't get to. As well as the website, there's facebook (with L plates) and twitter. So if you'd be so kind as to friend, follow or pass the message around in whatever way, I'd be grateful. Coburg is changing – I’ve had this conversation many times, one of the most memorable was with another resident in the Victoria Street Mall. I liked the changes and he didn’t, was this simply a matter of different tastes? He didn’t like the café culture although he couldn’t explain what was wrong with people talking and enjoying life. I enjoy having more good cafes and restaurants within walking distance of my home. I wanted to understand why he didn’t like the changes but he kept on talking about the way things used to be. In the end I could only conclude that he just didn’t like change. Coburg cannot simply be seen simply as a working class suburb in the north of Melbourne. Coburg is a mix of the old and new, people from around the world, a mix that creates a friendly atmosphere on the liminal zone. Coburg is now in the liminal zone the inner and outer suburbs but it was once a rural village just to the north of Melbourne. The basic structure of Coburg was laid out in the late 19th century when it was still a rural village aspiring to be a city. The row of churches, the grid of major streets, the pubs, the cemetery, and the civic and recreational spaces had been created before the population boomed. Coburg remains a mix, a muddled merger, a blend that hasn’t been homogenized into one substance. All there are many elements in this mix from the rural and urban, the mix of prison and industry, the mix of nationalities and a mix of classes. The mansions along the Avenue and the Grove are an indication the wealth of some people who lived in Coburg in the late 19th century. Richard Broome often comments in his book, Coburg – between two creeks, on this mix even when Coburg became a largely working class suburb in the 1920 – 70s. (p.215) Broome comments on the aspirations of Coburg’s blue-collar employees, reflected in the higher than average home ownership in the suburb. Coburg as suburb with high home ownership; even in the Great Depression there were only a handful of repossession in Coburg. Home ownership makes people, in a classic Marxist sense, not working class as they have capital. Although Coburg did have a large number of factory workers during the 1920 – 70s as the factories closed down the population mix changed yet again and Coburg became a dormitory suburb. The micro-suburbs like Connan’s Hill on the border of Coburg. Or “the Toorak of the north” as the original publicity claimed for the new suburb of Merlynston. Both of these mico-suburbs were urbanized post WWI before they were all farmland. Coburg’s Chinese population arrived along with the European settlement of the area and specialized in market gardening. Chinese market gardens opposite the Coburg Town Hall; the land was acquired by the city, although there were still Chinese working market gardens along the Merri Creek into the 1970s. The presence of the Chinese market gardens was marked by a piece of pavement art in the park. 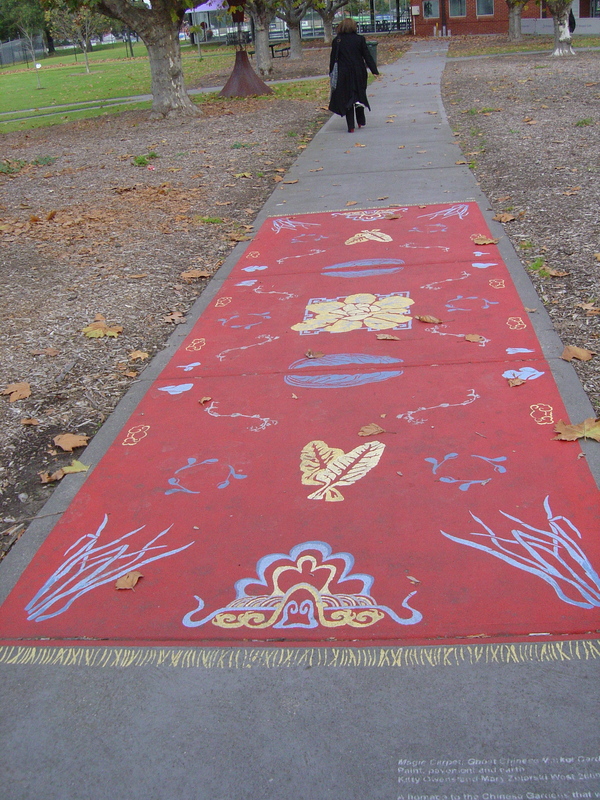 Kitty Owens and Mary Zbierski pavement painting ‘Magic Carpet’ (Ghost Chinese Market Garden) first exhibited as part of the Moreland Sculpture Show (it was in chalk then and was on a different piece of pavement), now the painting has gone too. The mix of Coburg is one of its many attractions; it makes for great people watching. I love walking or cycling around the suburb, I can do almost all my shopping locally and dine out locally. I do have to leave the suburb for art galleries and most of my live entertainment. 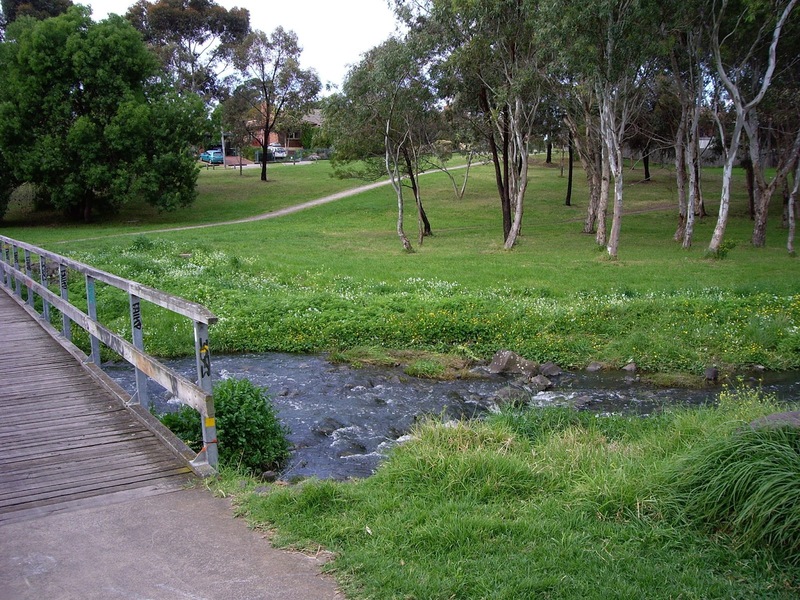 Coburg is an area of land bounded by the Merri and Moonee Valley creeks. The Moonee Valley creek is now just a large concrete drain but the Merri Creek is now an attractive place, recovering from its badly polluted state in the late 20th century. 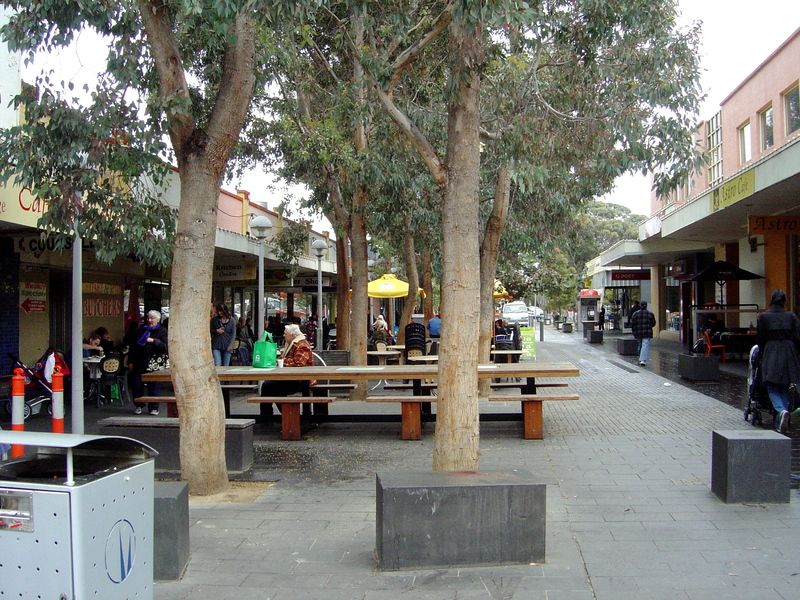 Coburg has changed from a village to a city, to a dormitory suburb, to a shopping and business hub. Coburg has changed since Europeans stole the land from the aborigines but it is now being done with greater taste. There is a greater sensitivity to preserving the local character. 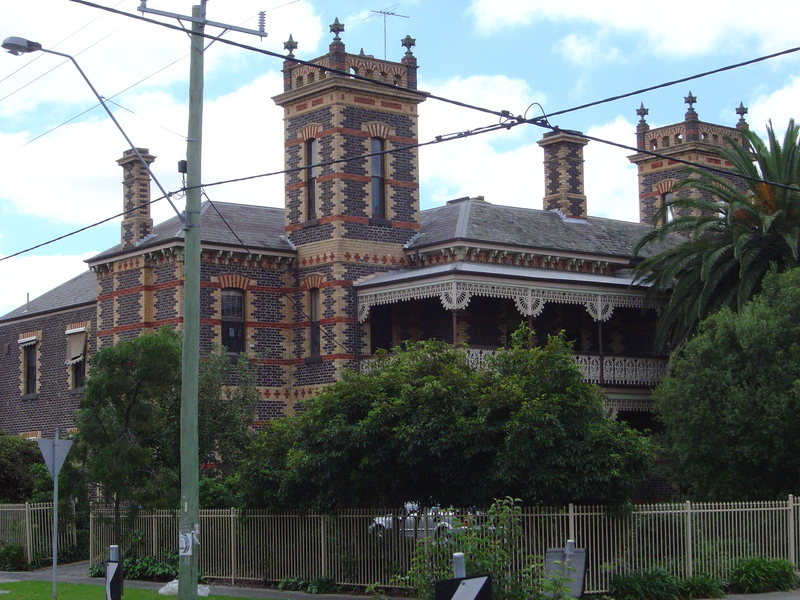 There are a surprising number of heritage listed buildings and heritage overlays in Coburg. Developers are preserving art deco facades of factories (see my post on Art Deco Coburg) and homeowners are restoring Federation era houses, renovating the interiors for the 21st century. There was plenty of insensitive development in Coburg in the 1960-80. Now there are many new construction sites along Sydney Road many of the old shops, garages and warehouses are coming down. The “Hygenic Building” still stands but the dairy behind it has long gone. I didn’t realize the passions raised by these changes in Coburg until I wrote my first blog Coburg 2010. But it is still out there, last week I got of pamphlet from the Save Coburg campaign. This is often the parochial politics of the current gentrification of a suburb, the financial and emotional attachment to the home, the financial pressures to move, the loss of rental spaces for students and other low-income groups. If you want to make really intelligent comments on this aspect of redevelopment then I suggest that you first read Michael Thompson’s Rubbish Theory, (Oxford, Oxford University Press, 1979); far too few people have read this brilliant book. Thompson describes the chaos mathematics of the forces operating to depopulated former inner city slums and makes them attractive places to gentrify. For more on the history of Coburg you can read Richard Broome, Coburg – between two creeks, (Lothian, 1987) but I must warn you that it is a boring local history with too much focus on details and not enough narrative. Broome had made full use of the archives but struggles to make a history out the material collected and his frequent contemporary asides are not an alternative to analysis.